The pick-up truck had been following me for several miles, sometimes hovering alongside, other times lagging behind but always there, the only other vehicle on this lonely road. I was riding through the remote Zagros Mountains in western Iran and although my entry into the country had attracted suspicion from police and border guards, I’d received a heart-warming welcome from all the regular Iranians I’d met so far. But this tailgating truck was making me nervous and I wondered if I’d attracted the attentions of those fundamentalist, anti-Western Islamists everyone warned me about. The truck continued to follow me, getting closer and closer. Through the cab window I caught a glimpse of the driver and his passenger, staring out at me. 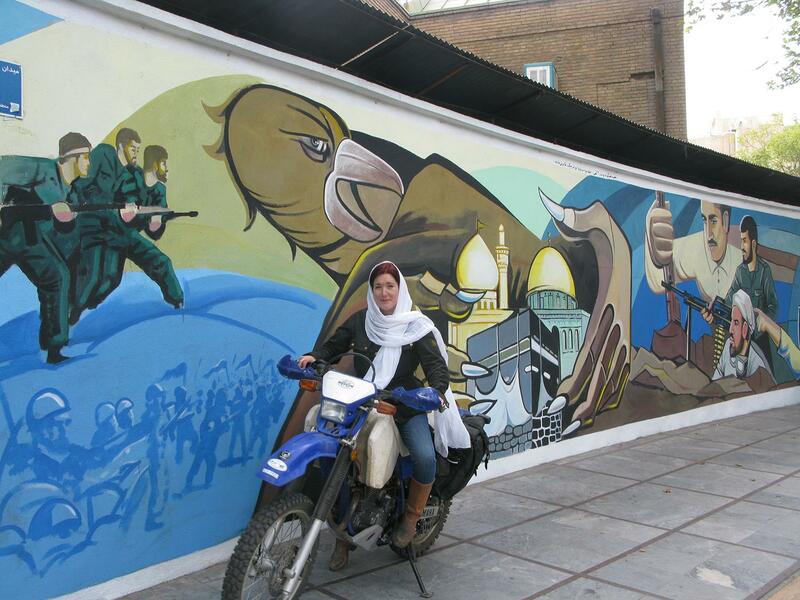 There was no denying that I was an unusual sight in Iran – a Western woman on a UK-plated bike was not an everyday occurrence here, a country where it is illegal for women to ride motorcycles in public. As the road climbed higher and all signs of civilisation ebbed away, I became ever more anxious about this trucker’s intentions. In an attempt to shake them off, I opened up the throttle but the truck accelerated too, engine roaring, billowing black exhaust smoke. They were just a few inches away from me now and the driver rolled down the window, shouting unintelligibly at me in Persian. First I ignored him, then tried shouting at him to leave me alone but he was forcing me off the road into the ditch and I had no choice but to pull over, my whole body trembling in fear. Sure enough, they stopped too, reversing back up to me at speed, almost knocking me over as they skidded to a halt in a cloud of dust. I was aware of two men jumping out of the cab, running towards me, shouting and waving their arms. My heart was pounding and I was all squared up for a scrap until I saw they were carrying bags of fruit, holding a digital camera and yelling and laughing with excitement, their smiles beaming.‘Hello! Hello! Welcome to Iran! We are so pleased to meet you! Please, we take photo!’ the younger one said, grinning like a maniac and thrusting peaches into my hands. This experience was typical of my ride around Iran where I was greeted with enthusiasm and unconditional hospitality at every turn – a far cry from the warnings and horror stories from the naysayers back home, who, of course had never been to Iran or even ridden a motorcycle outside the UK. That isn’t to say that there aren’t specific considerations for women adventure riders, but for each occasional hairy moment, there are a hundred moments of true joy, excitement and fun. The common perception is that a woman riding alone will inevitably come to a sticky end, but once you hit the road you actually discover that being female gives you access to all kinds of wonderfully interesting and enlightening situations. Your solo status means you are viewed as an unthreatening proposition by the people you meet and has the effect of making people want to look after you, bringing out the motherly instinct in the women, and the chivalry in the men. You’re a pretty safe bet to be housed, fed and watered by curious, friendly locals. And it is these experiences that are the very essence of a great motorcycle adventure. • Wear a wedding ring, fake or real. A husband gives you instant respectability in more traditional cultures. • Research the local dress codes before you leave and respect them in the country. • Assume that most people are going to be friendly and helpful. It’s generally the case. • Trust your instincts. If you feel uncomfortable, don’t tell people you’re alone or where you’re staying, but don’t let paranoia stop you meeting people and enjoying yourself. Was this the largest all-female GP track parade?